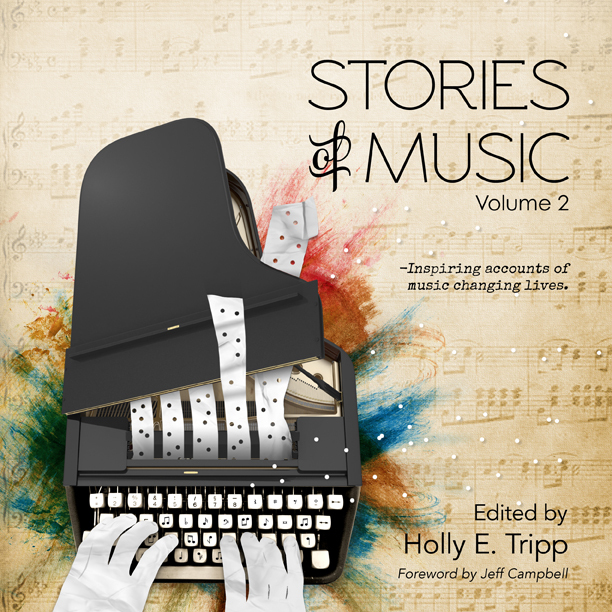 Denver, CO -- Holly E. Tripp once again shows us the power of music with Stories of Music, Volume 2, a follow-up to the award-winning, interactive anthology Stories of Music, Volume 1. In this book, she brings together authors and artists from 11 countries who tell their personal stories of how music has affected—and changed—their lives. The result is a mixed-media book that is emotionally impactful. Full of photos, poems, and essays, and designed for readers to interactively experience original music and videos, the book offers a full sensory experience. The anthology celebrates how music can propel people forward—despite obstacles, pain, and uncertainty—and in some cases, save lives, which Tripp feels is timely in today's world. "It has the power to bring us together," she said. "And in a time of astonishing turmoil occurring all over the world, I'd say we need it more now than ever before"
Music's ability to heal, to communicate peace, to express love, to inspire change, to build community, and to give us hope is helping to enlighten and open us up to a more harmonious existence. Holly Tripp's multimedia anthology series, Stories of Music, gives us hope that it is a real possibility. Holly's compilation of stories are beautiful examples of music's magical qualities that can help mend an ailing world. The book starts off with a section called "Origins" and a fascinating story, "The Magic of the Mouth Harp," which provides a historical look at the mouth harp—one of the oldest instruments known to man—and how harpist Neptune Chapotin discovered the instrument and created the World Mouth Harp Festival of India. Another section of the book includes "Against All Odds," and perhaps one of the most inspirational stories, "Lost and Found," about a man who fighting MS with the healing qualities of music. And quite touching is "The Deaf Composer" by award-winning poet Darrell Lindsey, about a man who was left deaf in a trauma, but still enjoys the world through remembered sounds and the new way in which music reaches him. Reminding us that it is never too late is the story of the new pianist Alma Bond, who learned to play the piano at age 91. Additional sections of the book include "Interconnection" (how music brings people together), "Exploration" (how some people have discovered their musical voices and journeys), "Transcendence" (how select musicians have transcended expectations), and "Ghosts" (how past musical experiences can both inspire and haunt us). The anthology ends with a striking photo, "Prayer with Conch Shell," taken on the steps of the Hindu holy city, Varanasi, India. Tripp grew up in a musical family, co-writing songs with her brother Brandon, and playing music with her parents. She also loved hearing stories of how her great-grandmother listened to music "jam sessions" through a telephone party line. It was after Brandon was killed in an auto accident in 2008 that she fully realized the impact music has on emotions. Since the siblings were bonded through music, music was how she finally coped with his death. She wrote 20 songs that year, and the songs, in a way, brought a part of him back to her. "There's a certain mystery to music that we can't explain, in the way that it touches us," said Tripp. "Music gives us an opportunity to communicate with one another in a profound way, beyond language"
To compile the book, Tripp put out a call for submissions in the art and literary communities. The results were over 1,000 submissions that she read through as they came in. "It was really difficult to pick," says Tripp, of the submissions. "But I started to see specific themes that really capture our most poignant experiences with music—how it can heal, create community, and inspire people to do amazing things"
The anthology is a masterpiece of mixed medium, and will reach audiences of all ages, races, and lifestyles. Acting on her belief that music heals, Tripp donates 10% of all proceeds to nonprofit organizations Hungry for Music and Music & Memory, the latter of which was the subject of the award-winning documentary Alive Inside. This anthology's predecessor, Stories of Music, Volume 1 is the winner of two 2016 Next Generation Indie Book Awards, including Third Place Grand Prize for nonfiction and another award for the anthology category. The book is also a 2016 Colorado Book Award winner for the anthology category. Stories of Music, Volume 2 promises to be an award-winning publication as well. Stories of Music, Volume 2 ISBN: 978-0-9969327-4-5 (pbk), ISBN: 978-0-9969327-5-2 (companion web edition), 2017, Timbre Press, Interactive paperback $29.00, 192 pages, includes URLs and QR codes throughout to direct readers to the free companion web edition for accessing audio and video pieces. The book is available on the author's website, https://storiesofmusic.com, and on Amazon and Barnes HYPERLINK "http://www.barnesandnoble.com/w/stories-of-music-volume-2-holly-e-tripp/1125428581?ean=9780996932745" HYPERLINK "http://www.barnesandnoble.com/w/stories-of-music-volume-2-holly-e-tripp/1125428581?ean=9780996932745"& HYPERLINK "http://www.barnesandnoble.com/w/stories-of-music-volume-2-holly-e-tripp/1125428581?ean=9780996932745" HYPERLINK "http://www.barnesandnoble.com/w/stories-of-music-volume-2-holly-e-tripp/1125428581?ean=9780996932745"Noble. Tripp grew up in a musical household with musician parents and a passion to follow in their footsteps. These musical beginnings, and a love for storytelling, inspired the Stories of Music series, with which she has set out to celebrate the ways in which music is changing lives around the world. She lives in Denver, CO with her husband, and has just released Stories of Music, Volume 2. Get E-mail Alerts When Holly E. Tripp Sends news releases.